A Russian Soyuz rocket carrying the unmanned Progress 65 cargo ship stands ready for its Dec. 1, 2016 launch at Baikonur Cosmodrome, Kazakhstan. The supply ship will deliver more than 2.5 tons of supplies to the International Space Station. A cargo resupply mission will launch to the International Space Station (ISS) this morning, and you can watch the spacecraft's liftoff and arrival at the orbiting laboratory via a live webcast. 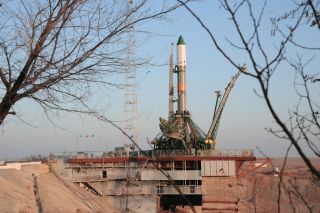 The uncrewed Russian Progress 65 rocket is scheduled to launch from the Baikonur Cosmodrome in Kazakhstan today (Dec. 1) at 9:51 a.m. EST (1451 GMT). You can watch the Progress cargo ship launch live here at Space.com beginning at 9:30 a.m. EST (1430 GMT), courtesy of NASA TV. After liftoff, the Progress spacecraft will spend about two days chasing the space station. Progress is slated to rendezvous with the ISS on Saturday at 11:43 a.m. EST (1643 GMT), when the spacecraft will connect to the space station via the docking port of the Russian Zvezda module. Video of the docking will also broadcast live via NASA TV, and you can watch that live webcast on Space.com as well. It's a busy couple of months for crewmembers aboard the ISS. The Progress spacecraft arrives just two weeks after a Russian Soyuz spacecraft delivered three new Expedition 50/51 crewmembers to the space station. On Dec. 9, the Japan Aerospace Exploration Agency will send another unpiloted cargo mission, HTV-6, to deliver supplies. Progress 65 will spend six months docked at the ISS before being set free to deorbit and burn up in Earth's atmosphere.